Q: can USB-UARTS really manage that 0.1ms inter-char spacing ??. There are many buffers in play here.. plus the 1ms USB quanta effects. Seem more optimistic than realistic ? I guess it would depend on how you feed it, wouldn't it? The Python code seems to be attempting to space the bytes 100us apart, which is what is fed into the channel. My point is the USB buffers and USB packet quanta, will not keep anything like 100us byte spacing. The average data rate can be paced (assuming Python can deliver a 0.1ms delay), but the buffering means there is no guarantee of 100us between each byte. Anyone got a Tiny817 + Python, who can comment out that delay and check operation ? [without doing any research] I'd think that if my AVR fed my FT232R a continuous "packet" of bytes that the FT wouldn't send each individually 1ms apart. Still seem to be some supply issues, but I think I can get the various bits without waiting with a combination of suppliers. Mouser did sell all of their stock of tiny817; Mouser has placed orders for 2 reels of tiny817 (both temperature ratings) with an ETA of about one month from now. In the meantime, microchipDIRECT has 3 reels of tiny817 125C with a low minimum (25) plus the partial reel fee. Surprised that microchipDIRECT sold all their stock of the full kit; it has a one three month lead. Surely the clearing out of the ICE was intentional. They sold off at a discount so they can fill up with a new batch where the housing does not say "Atmel".. It is quite plausible that the "ibdly" inter-char spacing is a relic from early debugging, or from before the correct two stop-bits configuration was in place. UPDI can handle a much tighter byte-stream. Did you confirm removing it ? Does removing it give a useful speed gain on larger downloads ? I think the half duplex is managed by the data blocks, as the host knows when the remote will reply. STK600 with STK600-RC024T-103 routing card and STK600-QFN24 top card. authentication and connectivity functions run in background. 1. Press Download Pack and save the .atzip file. 2. Import .atzip file into Atmel Studio 7, File->Import->Atmel Start Project. 3. 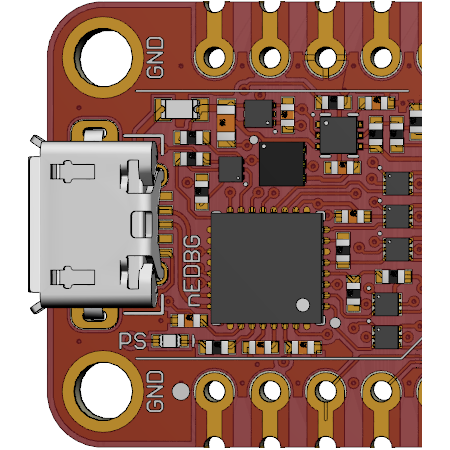 Build and flash onto field engagement board. 4. Open phone app "Secure AVR BLE IoT Node" and connect to the selected node. 5. If passing node authentication, it will show the range between phone and node on the first page. 6. Swiping left, the second page shows the temperature log from the node. 7. Swiping left to the last page, it shows the tri-axial acceleration data from the node. Microchip has released a new DeviceDoc for the ATtiny1614/ATtiny1616/ATtiny1617 Datasheet of devices. hehe, I wonder how does a change to the document only result in To Improve Manufacturability ? Has anyone seen which packages are offered for the Atiny32xx series yet ? how does a change to the document only result in To Improve Manufacturability ? Ahh yes, I've seen exactly that in action..... done by Philips for their CMOS Logic, when we reported some test values with a query. Like the second-last item, perhaps? Surprised that microchipDIRECT sold all their stock of the full kit; it has a one month lead. In stock but very low quantity and the lead time is now nearly three months. I'm concerned that tiny1614 will not stay in stock at microchipDIRECT for long. Microchip's "Letter to our clients"
I'm seeking interest in a group buy of tiny1614 before it goes out of stock. No commitment in this thread. Commitment occurs after I buy a snippet of a reel of tiny1614, create the group buy thread in Marketplace, then appear before a postmaster per your order. Risk to me is due to minimum quantity, partial reel fee, unsold tiny1614, value for it's at cost, USPS vagaries, and currency conversion. Risk to you is due to value (tiny1614, postage, package, any USPS delivery assurance); no minimum quantity with payment "in the mail" shortly after successful delivery. Mouser received one of two reels of tiny817; the other reel is due this week. 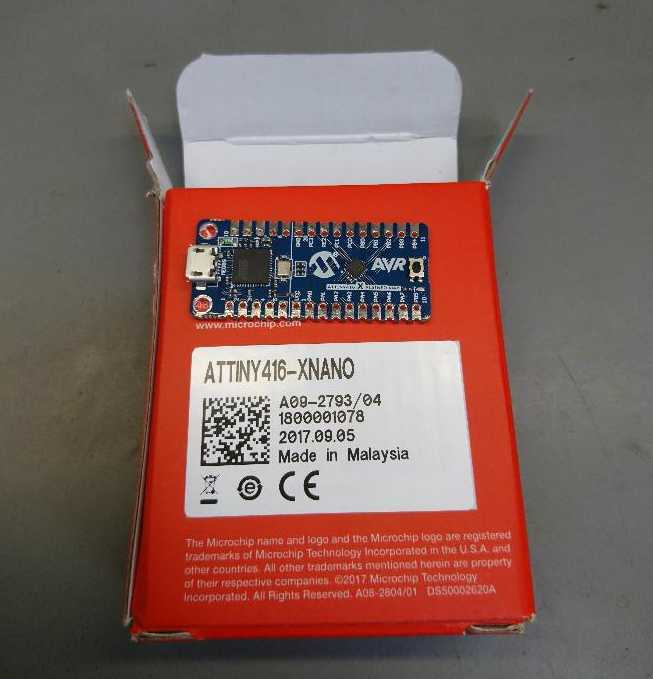 tiny1617 is zero stock; ETA at Mouser is 2017-Jun-16. Stock restored at Digi-Key and microchipDIRECT. Graphical user interface for Configurable Custom Logic (CCL) with support for SAM L21, ATtiny417, ATtiny814/816/817/1616/1617 and ATtiny321x. More tinyAVR 1-series in IAR EWAVR. Atmel-ICE full kit is low stock at Microchip; zero stock 2017-Aug-15. Stock restored 2017-Aug-16 to 136. Stock is plentiful at distributors. do i get it right, that reset pin is in RESET mode by default? I wanted to build my own mEDBG from ATmega32U4, but now I'm confused (pun intended). ...do i get it right, that reset pin is in RESET mode by default? do i get it right, that reset pin is in RESET mode by default? pull-up is detected by a connected debugger, the UPDI enable sequence, as depicted below, is started. for a 16KB tinyAVR 1-series. IIRC, UPDI is enabled as manufactured. OCD may be difficult as that's hidden; maybe do-able as debugWIRE has been somewhat deduced. What is open is the NVMCTRL and the UPDI instruction set; might inquire with Dean about adding UPDI to LUFA AVRISP as its hardware is ready for UPDI. I didn't saw replies and edited, sorry for that. I'm guessing for the tinyX we should burn the UPDI version? I had presumed that the firmwares were encrypted or protected in some way. e.g. like the STK500 upgrades from an encrypted bootloader. But since these are complete images you can just write to any 32U4 and get the appropriate mEDBG. I don't know which XMINI uses TPI. Note that mEDBG UPDI is reasonably fast. The other mEDBG are very SLOW compared to using a proper ATMEL-ICE. From Atmel's point of view, they could have used a UC32 instead of an AVR. I suppose that the 32U4 is 5V tolerant and does not require external level shifting. Yes, it's UPDI one, but unfortunately I had some communication issues. At first I could read ID, fuses and flash, but after writing led blinking project I cant connect any more.. I think, that might be some wires issues (uCs was on adapters on breadboard and sh***y USB cable) or EEPROM, which content I figured out myself. So here's my question: Can anyone share EEPROM and flash contents of 32U4 mEDBG from tiny817 Xmini? I care more about EEPROM, because flash is included to AS. Also 32U4 is 5V tolerant, as well as UPDI tinys. TPI is for tiny104 nano explained or similar name. About the encryption, it seems only the "good stuff", like Atmel-ICE firmware, is encrypted. Also I found this (nEDBG - nano-EDBG?) in the tools directory, anyone knows what it is? No, the MCU has 32 pins, it must be a 32U2 and not a 32U4 like mEDBG. About the encryption, it seems only the "good stuff", like Atmel-ICE firmware, is encrypted. This may or may not be the EEPROM map for the mEDBG, the aboslute address for each field in the EEPROM is (512 * bank) + address. The important one to get right for homebrews is FIRE register which tells Atmel Studio which firmware image to use when the tool is upgraded. The serial number, kit name, manufacturer name and target name are ASCII '\0' terminated strings. I see that the debugWIRE version binary is only 28657 bytes. I had always assumed that the 32u4 was very tight for Flash space. And the firmware had to make speed/size compromise. Although the 16MHz 32u4 has less processing power, the debugWIRE comms should have a similar performance i.e. limited to the hardware protocol speed. Of course it is up to Microchip/Atmel if they want to cripple the mEDBG versus the EDBG ATMEL-ICE.